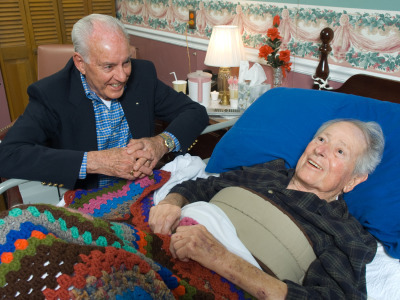 Providing comfort, encouragement and support is what hospice is all about. Families dealing with end-of-life issues are often stressed, exhausted, fearful and overwhelmed. Knowing that their loved one is being cared for by loving and experienced staff brings peace of mind and allows the family to rest and regain their strength. Southwest Christian Care comes alongside terminally ill patients and their family members to provide physical, emotional, and spiritual support. Our experienced and loving staff focuses on the unique needs of each patient to provide the best care possible. Whether providing hospice home care or center-based care, the goal is to help the patient live as fully as possible and to encourage and support the family as they deal with the illness of their loved one. At the heart of Southwest Christian Hospice is the affirmation of life. We are called a “Hospice of Hope” because of the conviction that the time of death may be permeated with a living hope for the believer, based on trust in Jesus Christ as Lord of life and death. We offer this “special way of caring” at no cost to patients and their families. Southwest Christian Care depends solely on the generous gifts of individuals, churches, civic groups, corporations, businesses and foundations. The team attempts to enhance the quality of life for the terminally ill patient and for their family members. Nursing care focuses on controlling pain, managing symptoms and ensuring assisted daily living needs are met. The team also provides emotional, spiritual, and social support during the illness and bereavement periods. The Hospice HomeCare Program is based on a team approach to helping the terminally ill patient and their family. The program helps the patient achieve physical and emotional comfort so they can remain at home and focus on quality of life. The hospice team works with the family in a variety of ways. For patients receiving care at home, the nurse teaches basic care to family members who will be providing care. Our Hospice HomeCare Services extend to five south Atlanta counties, including: South Fulton, Fayette, Coweta, Clayton and Henry. Although many patients remain at home, the Dyer Hospice Center provides an alternative with 12 beds for center-based care. When the intensity of physical and emotional stress on the patient and caregivers requires around-the-clock assistance, our in-patient unit is available. The goal of center-based care is to provide medical and emotional support to patients and their families in a home-like environment. Rooms are comfortable and attractively furnished, featuring large windows which overlook beautifully wooded grounds. Referrals for center-based care come from the entire metropolitan Atlanta area, as well as other areas throughout the State of Georgia and the Southeast. Respite care is also available for seven days and provides rest for caregivers by offering a short stay program for patients. To qualify for hospice care, the patient must have a terminal illness and no longer be undergoing curative treatment for the primary disease. A physician order for hospice care must be present. Qualifications for Hospice Center Based Care program requires a patient's life expectancy to be 2 months or less. Patients with a non-cancerous diagnosis will be evaluated monthly. For entry into our Home Care Hospice Program, the patient's life expectancy must be six months or less. The in-patient placement status for patients with non-cancer diagnosis is evaluated monthly. The patient must choose to have their personal physician or our Medical Director assume responsibility for their medical care. We serve people from all walks of life without regard to race, gender, religious affiliation or economic status.